As I discuss often, online shopping portals can be a great way to rack up bonus miles and points on your everyday online purchases – and many of your favorite airline, hotel and credit card sites offer them. 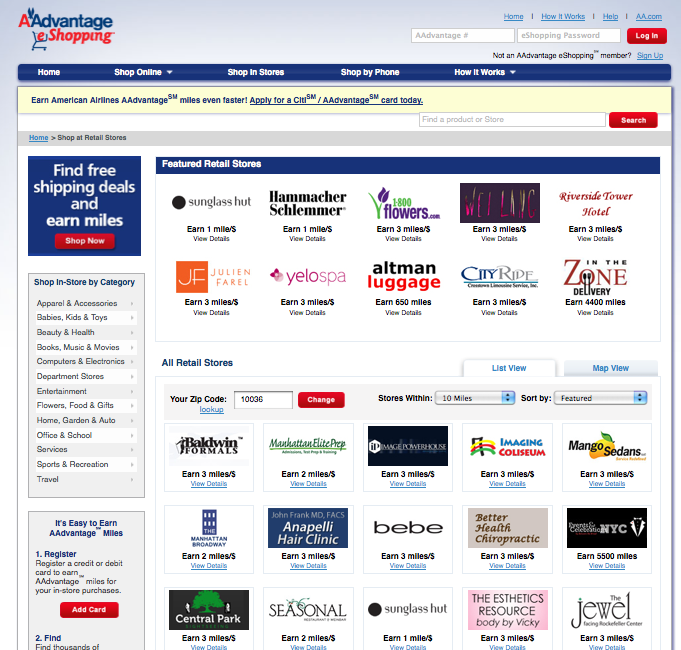 Some online shopping portals like American’s offer in-store bonuses too. What you might not realize, however, is that several of these same portals offer a section that will tell you which local retail stores you can earn bonus miles or points at by using your linked credit card. This isn’t necessarily the airline or hotel co-branded card, it’s the card that you have linked to your online shopping portal profile, so if you don’t remember which one it is, log into your account and make sure your cards are up to date. To find this section, go to your online portal of choice and then click on the tab on the left that says something like, “Shop at Retail Stores.” Then you simply enter your zip code and the site will generate a list. You can search by distance and by merchant A-Z, and you can view merchants as a list or on a map view. Here are the online shopping portals with a retail store page where you can find out which local shops are offering bonuses along with a few examples. Many are the same from portal to portal but there might be the difference in a mile or two per dollar, so be sure to check each if you find a merchant you’re interested in, and also be sure to compare the retail bonuses to the online shopping bonuses to make sure you’re getting the most points possible. Obviously merchants will vary from area to area, so I just looked up some in Manhattan and Los Angeles to give you a cross section of what you might expect. Some of them are a little random, so if you have a particular retailer in mind that you’re interested in, search alphabetically within the zip code. Some of the merchants are also restaurants, offering the chance to double dip both by using your linked credit card and going to a restaurant that is part of an airline or hotel’s dining rewards network. Other merchants are hotels, including those not part of chains, so if you wouldn’t be earning points on a stay anyway, it bears looking at whether that hotel is one of the retail merchants included in these portals since at least you can earn miles on them (see the Sunset Marquis on United’s shopping portal below). Also be sure to view the details of the offer since many are only good for a month or two, with a set end date, and some require a minimum purchase. Be careful to read the terms of offers carefully. PF Chang’s: 2 miles per dollar up to 2 times by June 30, 2013. Hawaiian’s portal has a handy map search function. HawaiianMiles Partners (map search): Most of these are in the islands themselves. 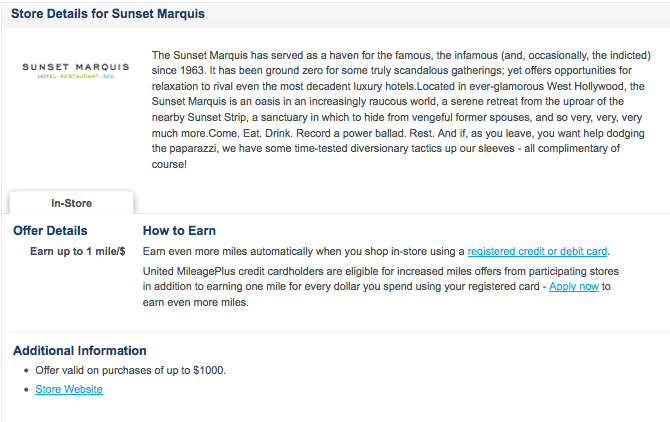 Sunset Marquis Hotel: Up to 1 mile per $1 on purchases up to $1,000. Sunglass Hut: 1 miles per $1 on purchases of $175 or more until July 31, 2013. Muttropolis (pet store): 2 miles per $1. Darque Tan: Up to 1 point per dollar on purchases up to $200. Joseph A Banks: 2 points per $1 until September 30, 2013. Barclaycard RewardsBoost: Barclaycard has a shopping portal whose offers vary depending on which of their cards you carry, but here is the one for the Arrival card. If I missed any portals that offer in-store retail bonuses, be sure to comment below and I’ll add them in. Like online shopping, this can be a great way to rack up extra miles without making much of an effort. It just takes a little homework to find out if the merchants you shop at offer in-store bonuses and then it pays to check periodically to see if the list of merchants has been updated or if promos have been extended.